There seem to be conventions – generally followed practices – among mattress and pillow manufacturers about naming models, series, and collections. One of these is renaming the first products when newer versions are introduced. Many companies who do this choose either “Original” or “Classic” for the older lines. While Original is self-explanatory, Classic is used more, probably because it seems classier than Original and does not come across as dowdy. 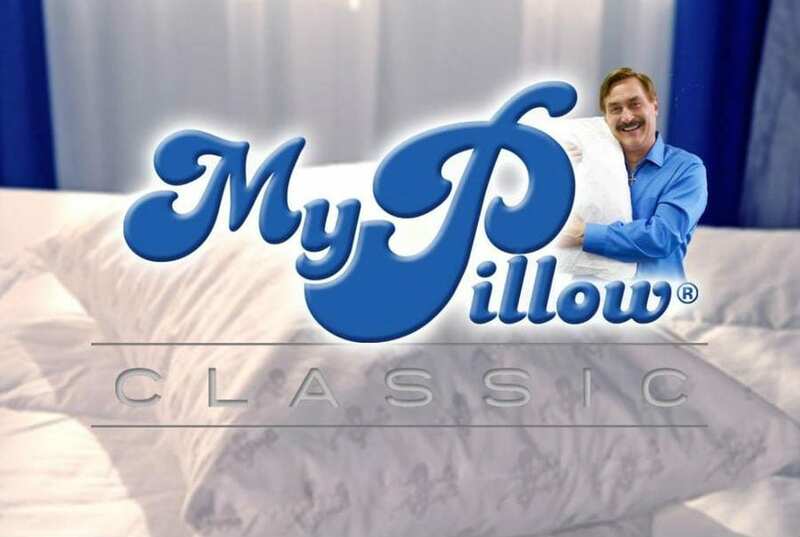 This classic use of the term appears to be applied to the Classic Series by MyPillow. While still available at many retailers, both online and in stores, this pillow series is no longer listed on the manufacturer’s website, where the MyPillow Premium is the featured model. Whether this is a long-term strategy (promoting the newest products on the home site, while keeping the older line available through retailers) or short-term (phasing out the older line while building the newer one) remains to be seen. The Classic Series and Premium Series by MyPillow look the same in pictures – they are the same sizes (Standard/Queen and King), and the repeated logo design of the cover fabric is the same. The significant difference is in the loft choices. The MyPillow Classic Series offers two loft levels, while the Premium Series offers three. Both guides use T-shirt sizes and gender. The fill of the MyPillow Classic Pillow is shredded polyurethane foam. MyPillow calls these “our Patented Interlocking Fill.” The same principle is at work as in pillows using shredded memory foam, such as the Snuggle-Pedic Shredded Memory Foam Body Pillow and Snuggle-Pedic Ultra-Luxury Shredded Memory Foam Pillow. Once the users have adjusted the shape of the pillow to their preference, the uneven edges of the foam pieces hold on to each other, maintaining their configuration. This is a mix of three sizes of pieces. Mike Lindell says the ratio of the three sizes has been selected for the best performance. 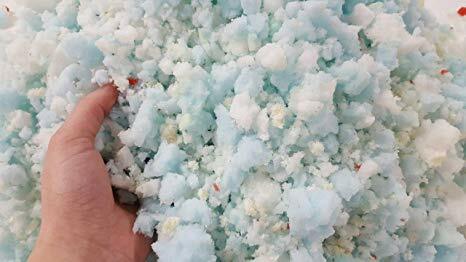 If comparative testing were done, it may show whether selecting the blend of sizes of foam pieces is better than a random mix. As of now, the only reliable comparative evaluation we have would be relative customer response, but this covers not only the sizes of foam pieces, but other variables among the different brands and models, such as the fill material (memory foam, polyester fiber, polyurethane foam, down and/or feathers, or other material), the cover, the liner, and customer service.. The cover of the MyPillow Classic is 100% cotton. Online descriptions do not mention a liner, a common feature of most pillows filled with loose material, and neither do major tester/reviewers. The fabric is covered with copies of the printed MyPillow logo. All pillows by MyPillow, including those in the Classic Series, are 100% made in America. The foam is certified by CertiPUR-US for low VOCs (volatile organic compounds) and no toxic substances. The MyPillow Classic is available in many brick-and-mortar stores, as well as through online retailers. In-store product is in a box. Pillows that are shipped are compressed, rolled, and in a sealed plastic bag for delivery by UPS, FedEx, or the U.S. Postal Service. Pillows in the MyPillow Classic Series are covered by a 60-day sleep trial and a 10-year warranty. The customer response to Classic Series pillows by MyPillow is mixed. The greatest number of reviews is on Amazon. As of July 17, 2018, there were 6,600 reviews, 5,072 of them verified customer reviews. As can be seen in the chart on the right, the ratings form an inverted bell curve, with the highest numbers of ratings being 5-stars and 1-star. The average customer rating was 3.57 (71.32%), but for all reviews it was 3.38 (67.54%). This difference may be accounted for by disgruntled customers who made their purchases on the MyPillow site seeking a platform for their complaints. 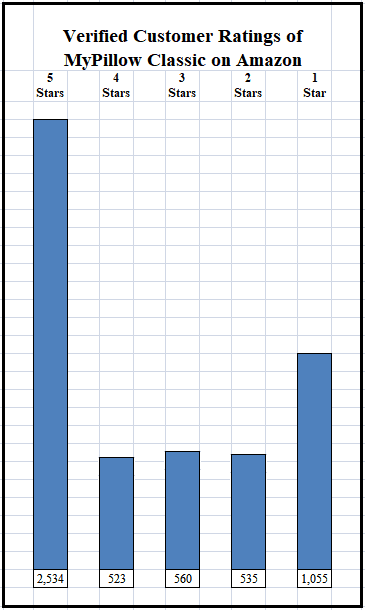 The second highest number of reviews (1,028) was on the television shopping channel QVC, with separate reviews for different sizes and whether cording was white or colored (the cord color indicates the loft). QVC reviews also had the lowest average rating of 3.30 (65.99%). The 805 reviews on Bed, Bath & Beyond had an average rating of 3.78 (75.58%). 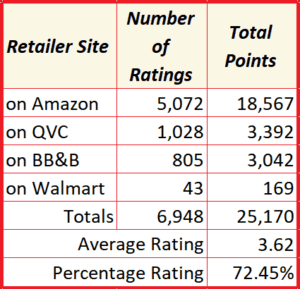 The weighted aggregate average rating for these three retailers plus Walmart is 3.62 Stars (72.45%). Many customers were very pleased with the MyPillow Classic pillow, citing support, holding its shape, being cool, and being adjustable. A few said the cover looked cheap. Some rated it as average. More common were complaints about not being able to re-adjust the pillow in the middle of sleep, noise, and customer service (when it came to warranty claims).